Panelist, “Land Preservation & Subdivision Law for Conveyancers & Estate Planners” Massachusetts Continuing Legal Education (2013). Panelist, “Dirty, Defective & Problematic, Properties & Buildings, Making an Ounce of Prevention Worth a Pound of Cure - Using Building Record (Jacket) Searches To Your Client’s Advantage,” Massachusetts Continuing Legal Education (2012). Speaker, “Conservation Restriction Basics,” Community Preservation Coalition– Massachusetts Conference on the Community Preservation Act (2012). Chair/Panelist, “Neighbor & Nuisance Law”, Massachusetts Continuing Legal Education (2009). 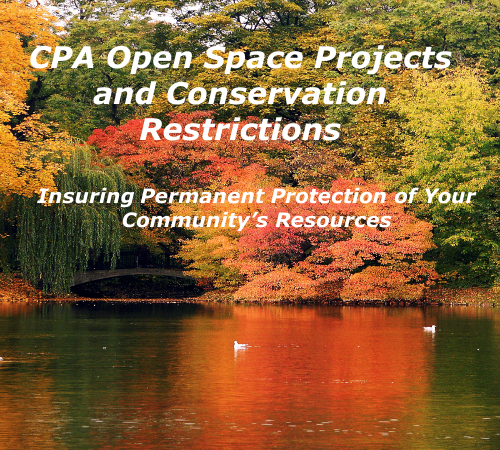 Speaker, “CPA Open Space Projects and Conservation Restrictions”, Community Preservation Coalition – Massachusetts Conference on the Community Preservation Act (2008). Chair/Moderator, “Subprime Lending Crisis: Where are we going and why are we in this handbasket?” Boston Bar Association Continuing Legal Education (2008). Speaker, "An Explanation of Amendments: Chapter Land Use Statutes" Boston Bar Association - Title & Conveyancing Committee (2007).